← Family-Size Festive Sweet Mince Pie. Vegan. 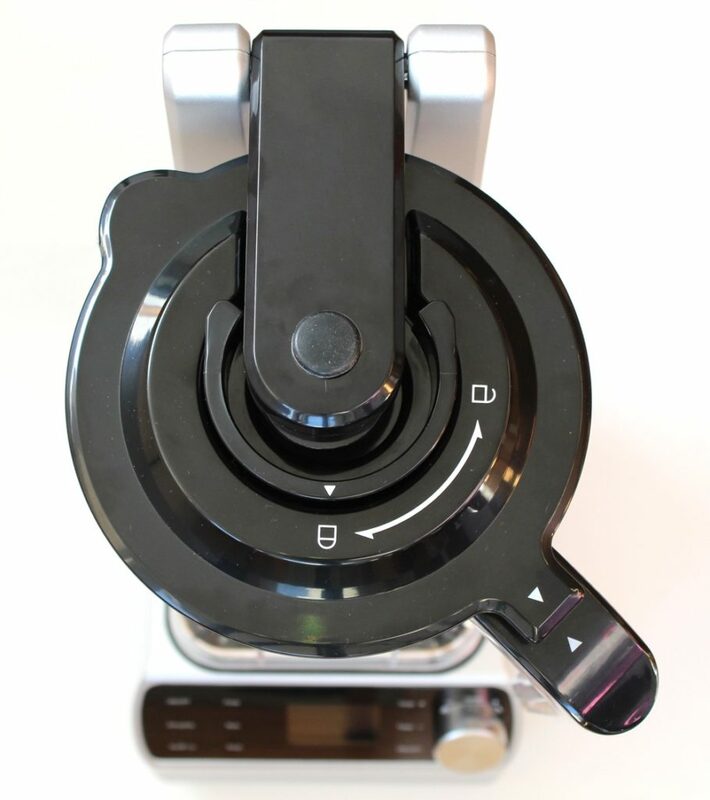 One of the perks of being a Froothie ambassador is that I get the chance to review their new kitchen gadgets. Their latest gadget – the Optimum Vac 2 Air Vacuum Blender – has been creating quite a buzz on social media so I couldn’t wait to get my hands on one and see what all the fuss was about. A shiny, new Vac 2 landed on my doorstep just over a week ago and I’ve already used it multiple times to make smoothies, juices, sauces, soups and chia puddings. In today’s post, I thought I’d share the lowdown on this new blender and what sets it apart from other blenders. I’ll also share what I’m loving about the blender as well as any first impression niggles. The Vac 2 is a great-looking machine. As you can see from the photo above, it has a sleek, modern design. It comes in three colours – silver, black and red. On top of the base sits a 2 litre BPA-free jug. It feels like a very sturdy, quality piece of kit, which is what you want for a power blender. The last thing you need is for your blender to be shaking and rattling loose as it blends. There’s an LED display panel which lights up blue when the machine is plugged in. There are four preset blending buttons – Smoothie, Vegs & Fruit, Nuts and Soup – as well as a Pulse button. 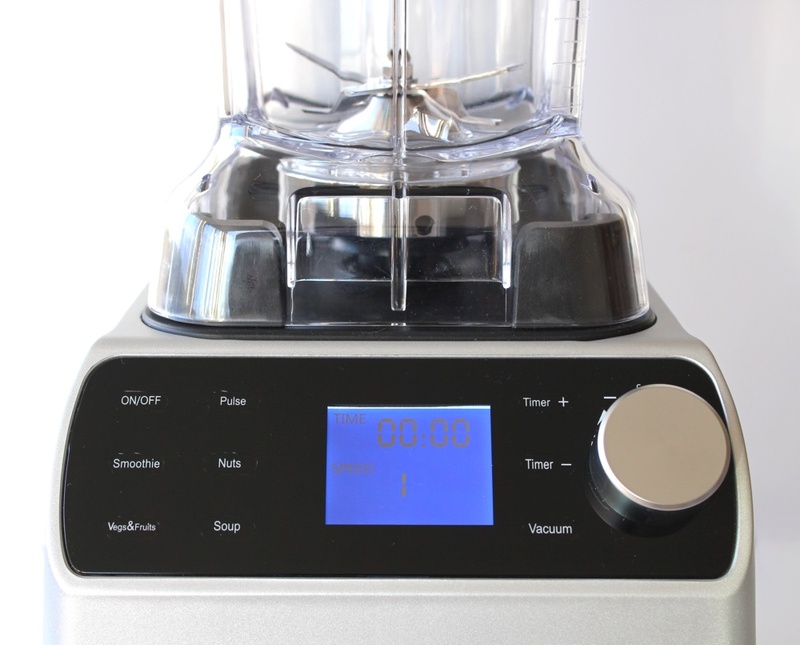 You can also set your own blending time (using the timer + and – buttons) and speed (from 1-8) using the dial. 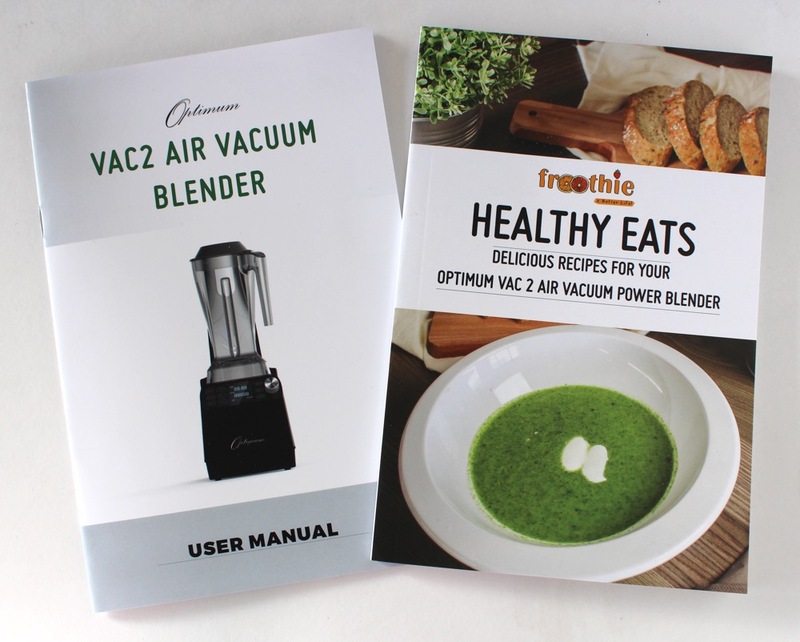 Froothie has shared a number of videos on its YouTube channel showing the difference between smoothies and juices made in the Vac 2 blender vs a non-vacuum blender. The vacuumed juices appear brighter in colour and stay that way for far longer. 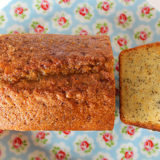 In addition, there is no layer separation between the ingredients. I was really looking forward to testing this out for myself. 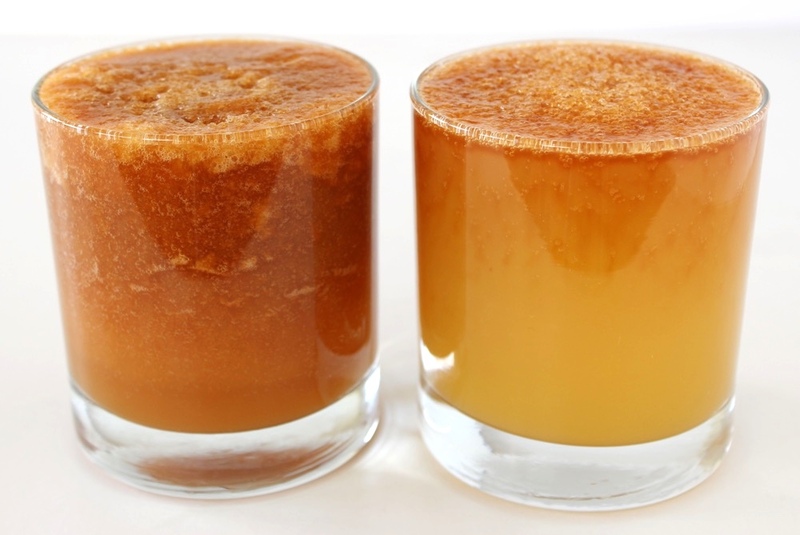 I like making apple juice by blending home-grown apples with water (and other ingredients like mint, lime, ginger and so forth) but this kind of juice rarely lasts long before it starts oxidising and going a rusty brown colour. This seemed like the perfect juice to test the Vac 2’s vacuum function and compare it to a regular blender. To make the comparison fair, I peeled both apples and weighed them so that exactly the same amount was added to each blender. 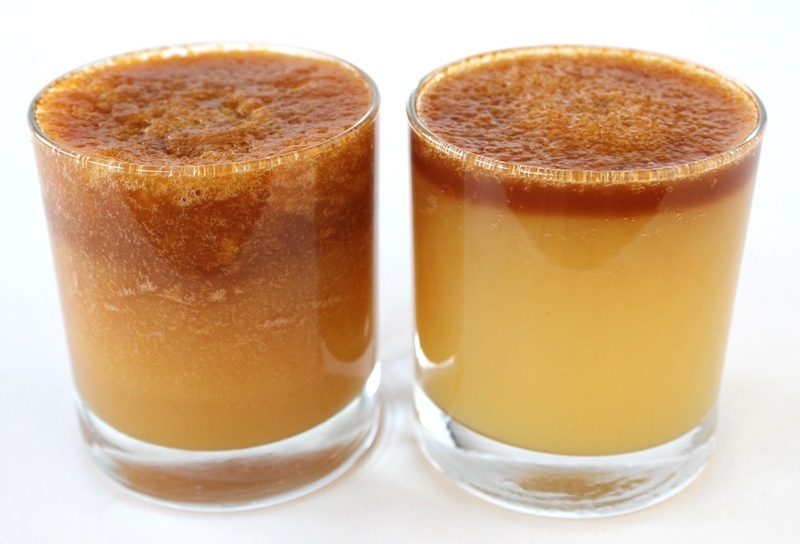 Here’s how the juices looked immediately after blending. The Vac 2 Vacuum Blender is on the right in the picture. I was amazed at the difference. 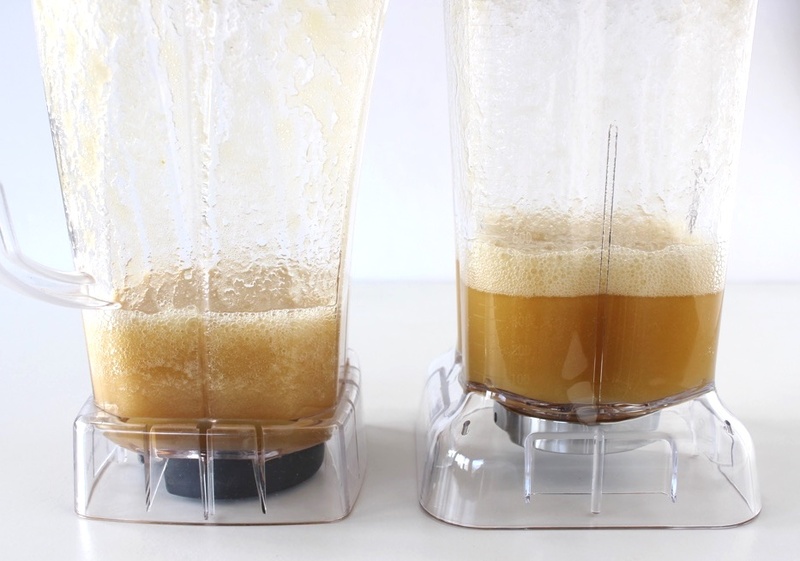 While the juice from the regular blender went a rusty brown colour and started to separate within minutes after blending, the juice blended in the Vac 2 Vacuum blender remained yellow and smooth in appearance (with just a thin layer of rusty bubbles on top where the juice is exposed to the air). 48 hours later and the juice still looked the same. If you’re really into juices/smoothies and are keen to preserve the nutrients, or want to make them ahead of time and not only preserve their nutrients but also their colour and smooth texture (avoiding layer separation), then a vacuum blender would be perfect for you. To use the vacuum function on the Vac 2, you simply lower the vacuum outlet on top of the jug lid. Press the vacuum button followed by either the smoothie or vegs/fruit button and then the ‘on’ button. The machine will start rumbling as it vacuums the jug for 70 seconds (and you’ll start to see bubbles moving up through the liquid) then it kickstarts the blending. To make sure the vacuum outlet is fully sealed on the lid, I hold it down for a few seconds when the vacuuming starts. 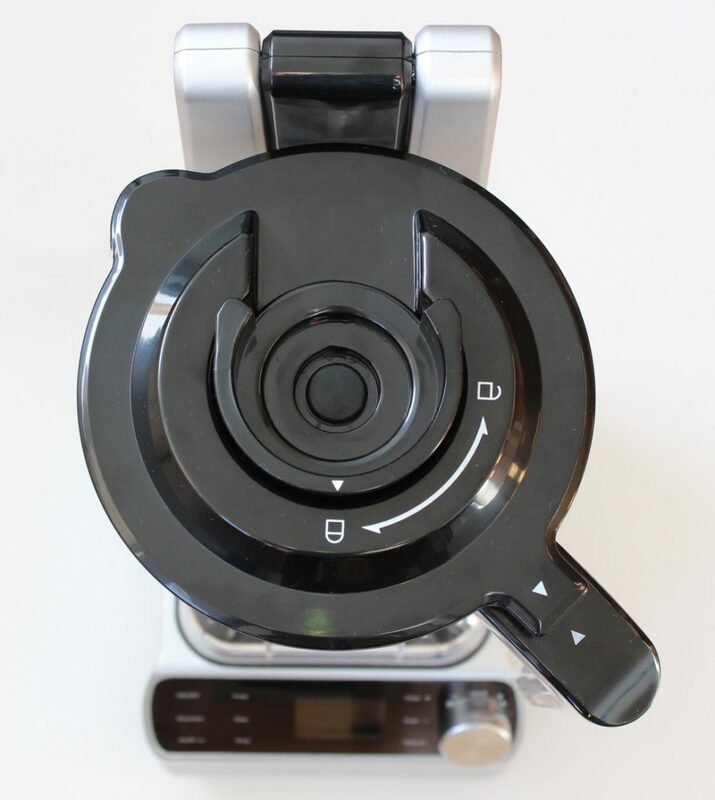 Once the blending is finished, press the valve button to release the vacuum and lift the vacuum outlet. Then, press the valve button on the small inner jug lid to release the vacuum, twist the small lid to open it then you’ll find the big jug lid comes off easy. 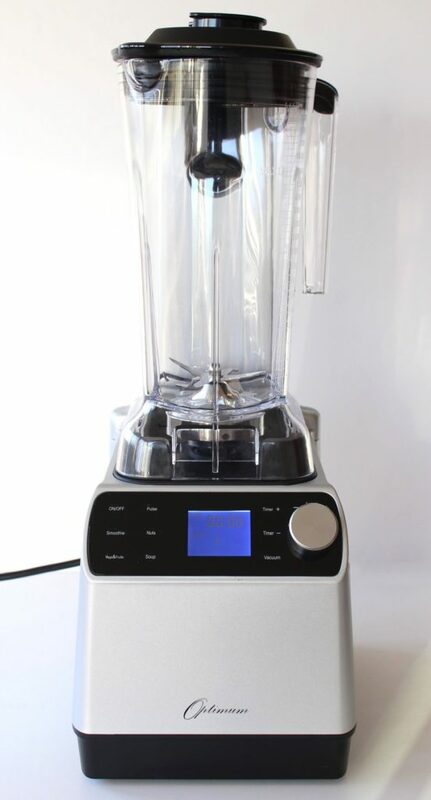 This blender has a maximum motor power of 2238W. It’s a beast of a machine. It starts it up, it roars into action and within seconds whatever fruit and veg I’ve thrown into the jug are transformed into a silky smooth liquid. There’s no need to pre-soak cashews for sauces, cheeses and milk as this machine blends them smooth within a flash. 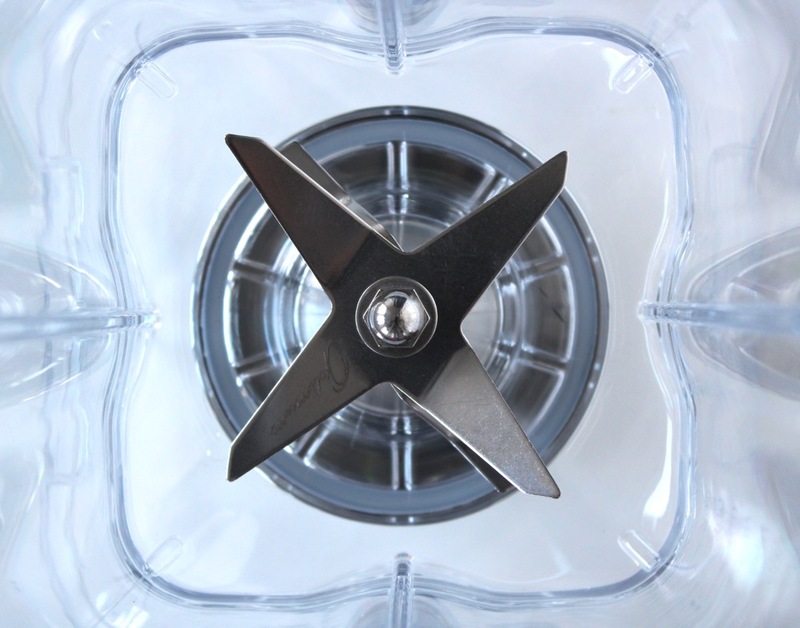 Just like my Optimum 9400 blender, the Vac 2 comes with 6 blades forged from premium quality stainless steel. This blade arrangement prevents dense foods from getting stuck at the bottom of the jug. They are super sharp so do not stick your fingers in the jug (like I have stupidly done… only once though). As well as a vacuum blender, you can also use the Vac 2 as a regular blender. I also like the fact that you have the flexibility to set your own time and speed as well as using the presets. I love the design of this blender and its sturdy, quality feel. The blue backlit LED display is really cool too! The blender comes with a tamper tool which is really handy when you’re making fruit ice creams, thick sauces or anything where you need to push the ingredients onto the blade. I love how this blender locks in the nutrients, vibrant colour, flavour and smooth texture of juices and smoothies through its nifty vacuum feature. This blender can actually warm soups and drinks. The Soup preset button sets the timer to 6 minutes so I’m guessing this is sufficient time to blend a soup’s raw ingredients and warm the soup. There are a number of raw and ‘no cook’ soup recipes in the book that comes with the blender. 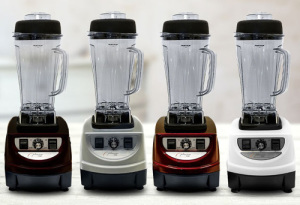 The blender also comes with a recipe book containing 74 recipes in 10 chapters (Smoothies & Drinks, Breakfasts, Cheese, Snacks, Breads and Crackers, Condiments, Dips & Sauces, Sides, Salads & Dressings, Soups, Meals, Desserts & Treats). 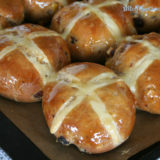 I’ve had a quick glance through and most of the recipes appear to be vegan, so I’m looking forward to trying them out. Any niggles with the Vac 2? While the blender itself is pretty noisy (83 DBA according to the manufacturer), it’s a low level sound (like a roar) so I don’t find it bothersome and it doesn’t hurt my ears. The RRP for this blender is £499 but, at the time of writing, it’s on special offer for £389 with FREE DELIVERY. You can also receive £20 off using my affiliate code (see details below). 0% Finance Available: Pay a 10% deposit then spread the payments over six months with 0% interest. The Vac 2 comes with a Five Year Warranty as standard. You can also pay to increase the warranty to 10 years. The Froothie Customer Support & Warranty Team is available 24/7 to answer your queries. Froothie also offers a 30 Day Trial Money Back Guarantee (including Return Postage Costs). You can find more details about the Money Back Guarantee by clicking on the ‘Our Promise’ tab towards the bottom of this Froothie page. As a Froothie Ambassador, I’m delighted to pass on a special code for you… enter code AMB20 at checkout to receive £20 off. 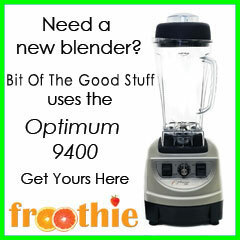 This offer applies to any blender, juicers, vibration plate and pressure cooker on the Froothie website. Also type ‘Ambassador code 1946: FREE DELIVERY’ in the comments box at checkout to receive free delivery. The delivery charge will be credited back onto your credit card. Alternatively, mention my Affiliate Code to the sales team when ordering over the phone. Disclosure. As a Froothie ambassador, I received a Vac 2 Air Vacuum Blender to review but, as always, all views expressed in this post are my own. 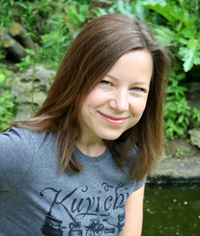 I receive a commission when readers purchase a product via Froothie using my ambassador code. Any monies received are re-invested back into the Bit of the Good Stuff, so many thanks in advance for your support. Thanks Nico! It’s an awesome blender isn’t it? I love how powerful it is and how everything is blitzed smooth in a matter of seconds. I’ve been using it for about a month now and I’m still fascinated by the vacuum function. It makes such a difference to the colour and longevity of smoothies & juices! Please can you try making almond butter without being toasted? 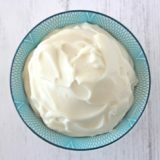 I saw a video of 9400 that creates a butter in just over a minute! I would really like someone to do a video too. Frothie has made a video on peanut butter, but it’s a pity that the video is not in its entirety, so we do not understand the actual necessary work. That’s amazing to hear that the 9400 makes nut butter in just over a minute! I have the 9400 (and love it!) but I’ve never made almond butter before as I tend to buy it the Meridian jars instead. 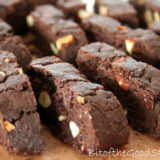 I’ll pass on your request to Froothie for a nut butter video. I’m sure a lot of people would find it helpful. Fab review. I’m really enjoying the vacuum function of this blender and have definitely noticed a difference. Thank you for such a detailed review, Sharon! I think that Optimum Vac 2 Air Vacuum Blender will become a great alternative to nowadays-popular Vitamix, NutriBullet and Ninja blenders. As I noticed, Optimum Vac 2 is still inferior to the market’s leaders in popularity. But I think that it’s time will come. 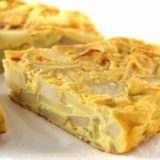 Vacuum function should attract healthy food lovers! Hi. I’m Sharon. Originally from Essex, I now live in Bath with my husband and 15 year old son. 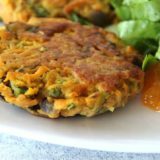 This is a blog about the stuff I’m currently passionate about, including my journey into the world of whole food plant-based cooking. 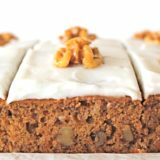 All recipes on this site are vegan and family-friendly. ‘Butter Chicken’ … Vegan Style! Chinese Egg-Fried Rice … Vegan Style! 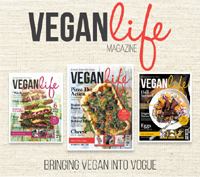 Polo Jafri on ‘Butter Chicken’ … Vegan Style! 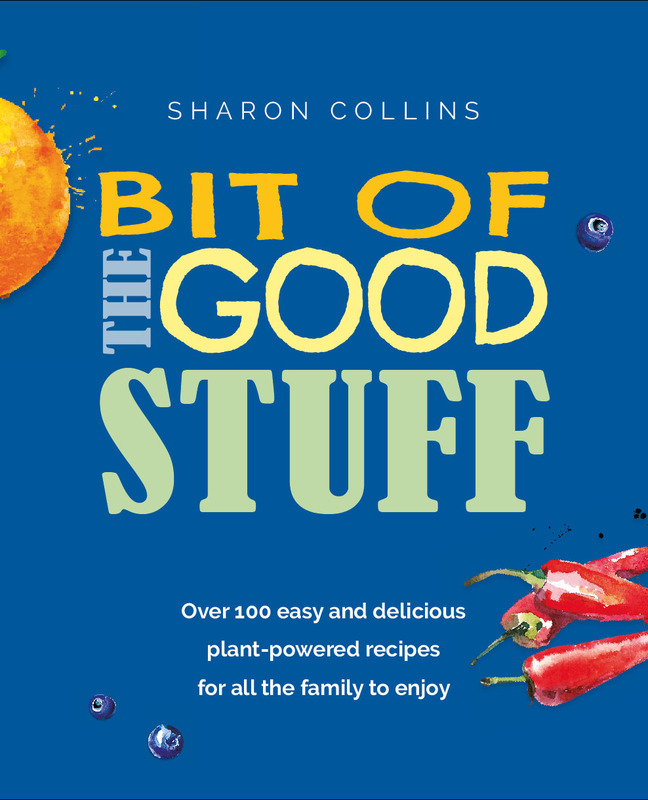 Bit of the Good Stuff is a participant in the Amazon EU Services Associates Program, an affiliate advertising program designed to provide a means for sites to earn advertising fees by advertising and linking to Amazon.co.uk. © 2011-2018 Bit of the Good Stuff. All rights reserved. Content & images from this site must not be used elsewhere without permission. Never miss a post! 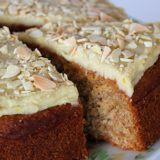 Sign up to receive email notifications of new recipes, features and special offers.